Believe it or not, we nerds will die, too! | Windows 7 is easy! There are online services, free and paid-for, to help you in this. Maybe the best known is Entrusted.com. At simplest you just register, tell the site all your email accounts etc., passwords to your encrypted drives and PC’s, websites and so on, and give instructions as when, how and to whom this information should be delivered when you are gone and the site has gotten proof of your death. Then you just add instructions to contact this site on your will. 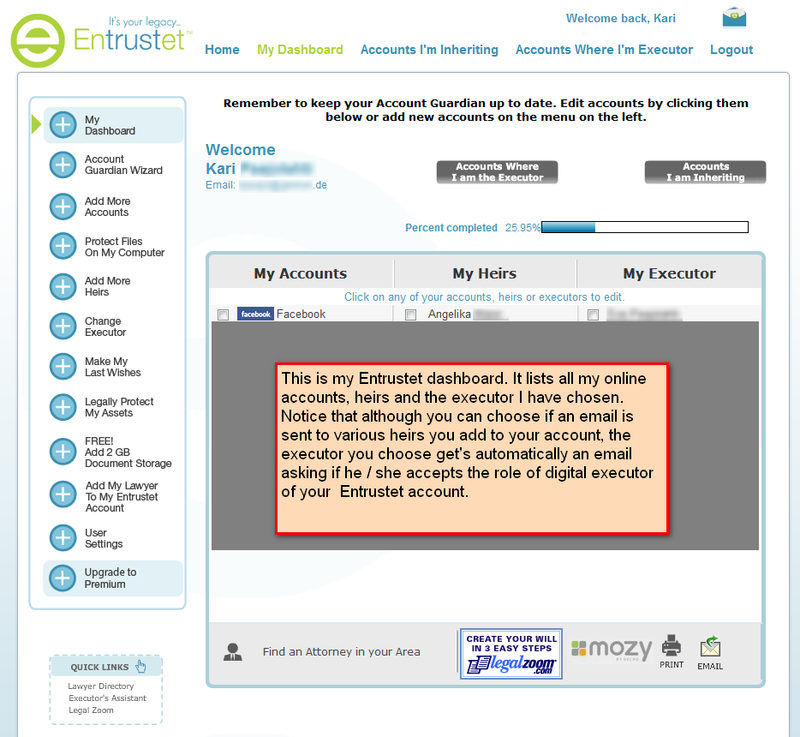 Although using Entrustet, I have also created my own system, my personal digital will. This is not meant to be a recommendation on how to do it, I’m just telling how I have done it. Having family and heirs in several countries, not only in my native Finland and adopted home country Germany, there’s so much to think I thought having a backup system does not hurt. I have three identical, high quality USB drives, a master and two backups. Master is always in my pocket, comes with me wherever I go while backups are stored in home safe. All three have only one file, an Excel spreadsheet. When I alter the master, I also update both backups. I use True Crypt to encrypt these USB drives and the spreadsheet. The Excel spreadsheet contains a complete list of my online credentials, from email accounts and websites like eBay and YouTube to forums like our Eight and Seven Forums. Although already retired, I still webmaster a few websites and the list also contains necessary administrative and FTP credentials to these sites, as well as of my encrypted drives and PC’s including the credentials to my Windows, Linux and MAC user accounts. It also contains the combinations to our small home safe and one even smaller I have in my car. Also listed are all pin codes to my mobile devices, banking and credit cards and various voicemail accounts, and credentials to various online banking and credit card accounts. Both in Finland and smaller extent here in Germany you can opt-in for online bills. All my bills from Finland and most of German ones come to an ePost service instead of normal mail, so credentials for ePost service are also included. Last step: on my real “paper” will, I tell about my USB “digital wills” and tell the True Crypt password to access them. This way I can be sure nothing is left secret, not found. I give quite simple instructions on the will on for instance which websites should be closed, which could be given to whom and so on. I have registered some 20+ URL’s, for those I also give instructions how and to whom Angie (hopefully I’ll go first!) should give / sell them. I am a bit quite vain person, so I also tell on the will which online contents I would like to stay (some photos on various online services and so on for instance), and which to remove. Stupid, I know, but who wouldn’t want to have a say in how people are going to remember you? Nerds will die, too. For me being prepared does not mean I expect it to happen any time soon. It just means I am in peace; I know that whatever happens, my family finds everything they need to find. This entry was posted on Monday, February 14th, 2011 at 00:31 and is filed under Digital Inheritance, General, Intellectual Property. You can follow any responses to this entry through the RSS 2.0 feed. You can leave a response, or trackback from your own site. 2 Responses to Believe it or not, we nerds will die, too! I think this issue is a taboo without a single good reason, something that should be discussed more. We geeks and nerds use countless hours to secure our systems, without thinking what can happen when suddenly we are no longer here.